What does being “inside maker” mean? 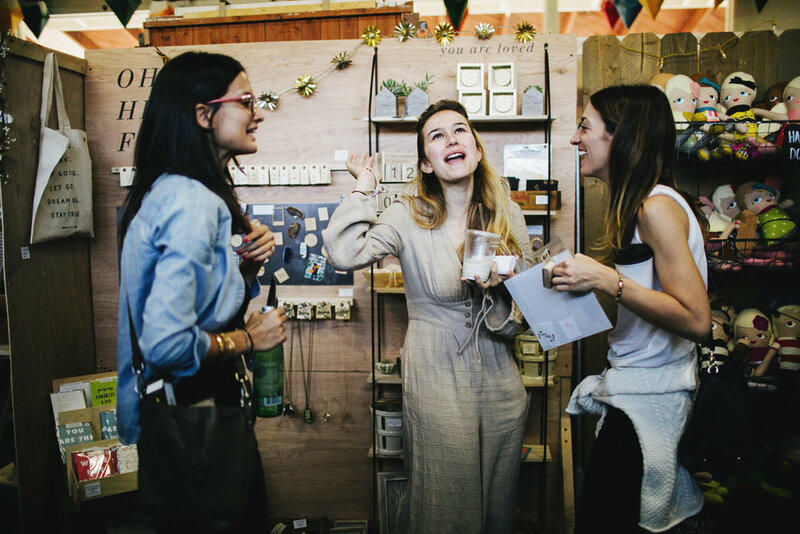 There are two parts to Mermade Market, and together, it makes it a truly magical event. The building on the site, is used for our “inside” shopping… where 45 shops leave their products for all 3 days, retail style, and they don’t stay at their space to sell. There simply isn’t room for that, plus, that’s not what it was created for. The inside portion of Mermade is a huge reason & part of why we created the Market in the first place. In fact, we didn’t add the outside area of the market until 4 years in. 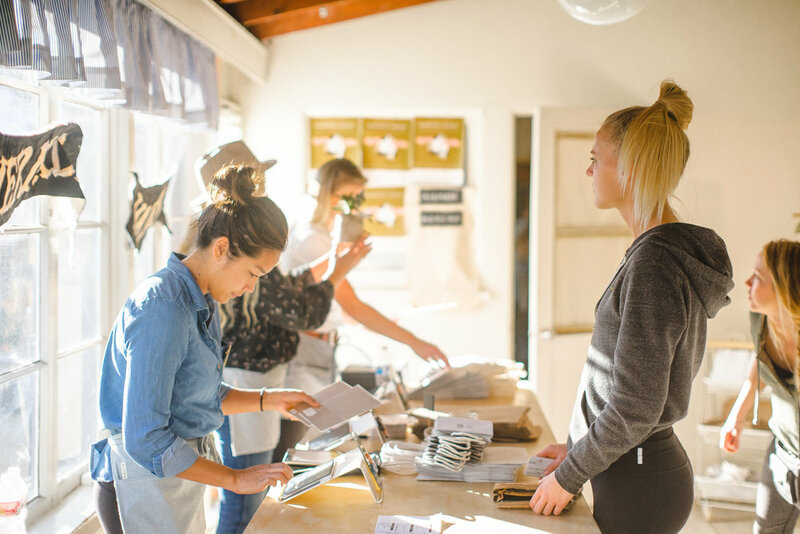 As handmade market customers ourselves, we loved the idea of being able to shop, pressure free. We do however see the need for the makers that can keep their cool, sell well, and the need from the customers that they want to “meet the maker”. So if you are the type of person that HAS to be there to sell, check out our outside information and see if one of those days would be better to sell. But for those of you that get nervous to sell, have a full time day job, are busy with family life, or just life… we gotchyou. There are 4 registers near the exit, where everyone checks out. We track each sale & pay each maker within 1 week of the show. 2 weeks prior to the event date, you send us your inventory list & prices. You need to be punctual for both. We understand Mermade Market is small space. So we can’t give you a big space to sell. That’s why you will see many suggestions & tips on how to use your space in the wisest way possible. Like having book shelves & cork boards & metal pipes draping over your space to hang those t-shirts or lights …rather than a table with a spread of stuff laying flat on them. Many makers that come to us, finish the show with a lot more wisdom because they had a crash course on using their space wisely. For most of our makers, its either their first time ever doing a show, and definitely the first time our customer has heard of their shop. So let’s make a great & lasting impression! -You MUST have your shop name listed somewhere in your space. This allows our staff on the floor to quickly answer people’s questions & for customers to feel like it is a legit small shop..not something thrown together to make a quick buck. -Add some spring to your space! Think fresh hangings or vases with flowers in them. Perhaps flowers bordering your peg board. Here is our Pinterest board to give you some space inspiration. You know, to get those creative wheels of yours, turning in a new way than they have before. Especially if you’ve shown with us before. Gotta keep it fresh! Think shelving, think new shapes… think LIGHTS to show off your amazing product. We offer power and you can be put anywhere on the floor and we can make it work. Just bring your own extension cord with your name attached to it. Try & get away from the idea of a TABLE. Blah. So boring! Clearly, some products demand a need for a table, but if you MUST, use the table as support for a better display that needs a table for height. If you are a first timer to our show (or any show), and feel you may need extra help understanding how to display, please consult with us. We want your booth to elevate your products and keep the customer at your table longer than a walk by. It is highly encouraged that you have extra inventory for when you start to sell what is out on your display. It’s a 3 day event, unlike other markets, and people do sell out all the time. It can be a big bummer to see the potential of sales, as well as a space that could have been used by a shop that would have been more prepared. We’d say about 10 makers have restock for us in the back storage room. Our staff members use it to grab the restock (like when that size 4T sells, they go and restock that same 4T shirt back on the floor). If you have a shop space where you can store your restock in cute bins down below… go for it. You are welcome to stop by and restock your shelves, yourself, but we only ask you do so during the slower hours (afternoon). We will kick you out if it's busy. If you can restock without carrying boxes in or sitting on the ground to spread out the goods… then you can do it whenever. IF YOU DO RESTOCK ON OUR OWN, MAKE SURE THE NEWLY STOCKED ITEMS ARE PRICED! Any new prices since sending in your inventory sheet, must be reported & emailed ahead of time. Your unique Mermade ID will be issued to you when accepted to the market. 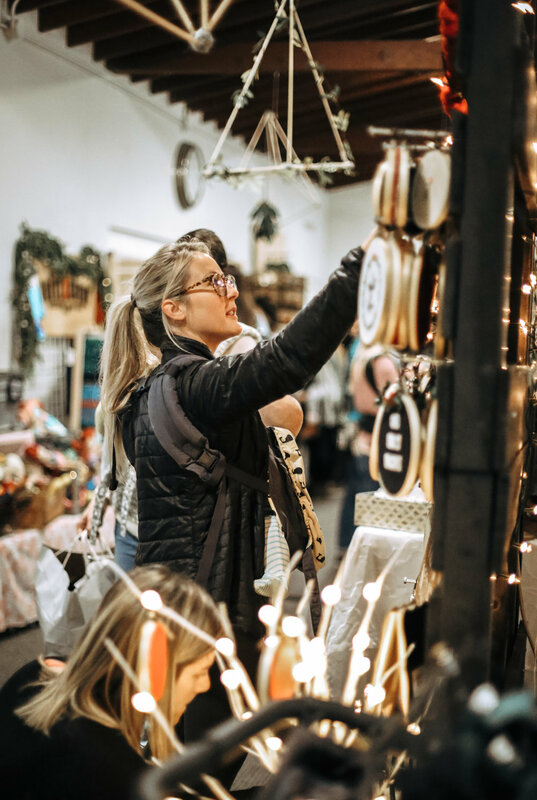 Then, 2-3 weeks before the show, we let you know how to label your products + make sure that each product you want to sell, is actually in fact, labeled, so we can enter it into the Mermade register. Please have every single item clearly marked with a price and your vendor ID. And at the same time, make sure they are large enough to be seen quickly at the registers. Do NOT have your tag larger than your item you're selling. It never looks good and can be awkward. Please affix tags neatly and professionally, so they stay put and we can be sure to give you credit for every single sale. If your price isn’t on tag, and there is a line of shoppers, we will have to guess what the price is based on your other items. IF YOU DO NOT LABEL YOUR PRODUCTS CORRECTLY OR AT ALL, WE WILL TAKE OUT $100 FROM YOUR FINAL PAYMENT. If you are a “treat” maker, this will be your space. 1 shelf space on a tall book shelf that sits directly next to the 4 registers. 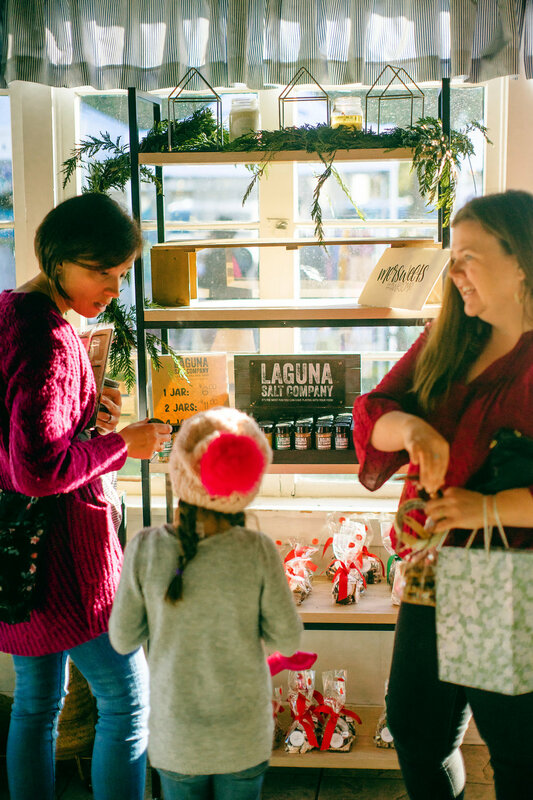 Our loyal Mermade customer looks forward to this because it’s a treat while they shop, it’s a reward for their shopping, and it’s the perfect gift to say thank you to their husband or mom for taking the kids while they shopped solo. We’ve learned a lot in the past 9 shows, and these treats should not be priced more than $10. They are replenished often, as they sell out quick, and we definitely recommend you let us use our fridge to store them if you aren't coming by hourly to restock. If you live far away and don't see yourself coming to restock the fridge/shop space often, we suggest you apply only as an outside maker. We only choose 4 makers max under this category, because we don't want to give too many options to our customers, as that can be overwhelming for impulse buying. We of course don’t book 2 cookie makers or more than 1 in any category.. and if we only book 2, you will get 2 shelf spaces. If you click this option on your application.. that means you are prepared for the below! Make sure you fully understand what this entails. We are BEYOND stoked to introduce this in our inside space. It is designed to fit multiple shops in one space to become a “Boutique”. Have that collected feel & enable more shops to be apart of the Magic of Mermade. We tried this out for the first time, Holiday 2018, and it actually turned out wayyyyy better than we ever could have dreamt. So we are doing it again!!! (The photo above is the original one). In simple terms, if you don’t have enough product to fill an entire normal shop space… (like you don’t have more than 1 design of your product… or you only sell kids hats & don’t need to take up more than 2 feet..) then this is your dream spot. The only catch, is you will have to be OK to work in a group. After you’re accepted & you pay your invoice, you will be given the emails of the other small shops that opted in for this. So that you guys can email back & forth & possibly exchange phone numbers if you need to. If you won’t communicate well with the other people or will go dark after the first email, this won’t be your thing. One super dreamy part about this, is that our team provides the shelving and display for you. It’s up to you and the chosen few, to make it come together as a welcoming space. 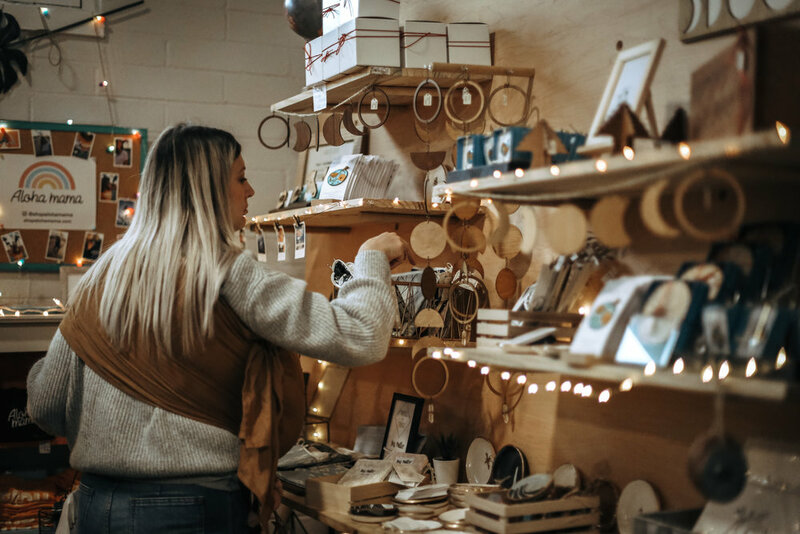 You can add your business cards, some smaller signage for your shop space, but your goods will be spread around and not concentrated to one area. You can click this option, as well as another option, in case we don’t have room for your bigger shop space. The only reason we wouldn’t & still want your space in a small way, is if you’re a repeat maker. If you choose a bigger option and we feel you would in fact be better suited to display in a bigger way, we will choose the bigger option. It is only a 2 foot wide space (we fit 5 makers into 10 feet of space). Upon your acceptance, we will send you postcards to share with family, friends, etc. as well as versions to email or post online. Be sure to leverage social media- Facebook, Instagram, Twitter, websites and blogs. The more people that know of the show, the more that will come see your awesomeness. Also, be sure not to advertise too soon or else they will forget or get sick of hearing about it by the time the show starts. 1 month prior is a great go-to, with word of mouth & excitement around the time you’re accepted. It’s a curated show! It’s a great accomplishment for sure. We have options in our applications for guarantee’d social media shout outs & giveaways & swag if you want to get in on it. If it’s something you want to take advantage of with your small shop. We really enjoy reposting & sharing in your excitement & your beautiful photos you post.. but we can’t do it for everyone. If we see it, we can repost it. If we don’t see it, chances are, we won’t repost or add it to our grid. If you’d like that for sure chance of it getting posted on our high traffic social media pages.. then for sure check out a way to pay for a secure spot on the application. We do our best to keep your items safe. However, in the event that something goes missing or is broken, we cannot be held responsible. We will have after hours security, and we also monitor the venue during open hours with staff/cameras. Our staff walk the floor consistently, with a Mermade Tag, as well as aprons, setting them apart from a shopper. Custom Forms are not commonly filled out by your customer, inside. If you feel like you would need this to be successful in sales, outside is your jam. You can always have a sign at your shop space that says something like "We do custom, see our website!" Or have a sign up sheet/mailing list type thing. The entire event is free for customers. Inside & outside. If you can’t be there to set up the Wednesday before the show, from 5-9pm, then you cannot do the show! There is no other set up date. Once the show starts, it is go time and there will be no room for any sort of set up.